This has been a stunning week for illustrating the best achievements of courageous young people. Surrey Young Carers had their annual conference on Tuesday and it was led and delivered by young carers. There are some 1,700 young carers who are "known" in the county, but in reality some 14,000 are thought to have this role. The conference included some of the stories of their experiences in caring but also some of the consequences of their commitments to caring for parents and siblings – sometimes poorer education and health problems - often anger (unsurprisingly) and some regrets at not being able to have an ordinary teenage life. However, these were views expressed only when with other young carers; their "public face" was simply "I look after my Mum" as if that was the most normal thing in the world. My input on the day was to facilitate 4 sessions of a workshop discussion about what community initiatives could be taken to support young carers, and there were a great number of ideas. I can’t let the week pass without mention of the very remarkable young man, the 19 year old Stephen Sutton, who bravely faced his death from incurable bowel cancer and was such an inspiration that he has raised over £4 million for the Teenage Cancer Trust. His memorial service was in Lichfield Cathedral today – a stunning example of how one person of exceptional character and vision can affect us all. I am off shortly to a meeting with another young man who is severely disabled but set up his own charity and does marvellous work in Surrey and overseas…supported by his devoted mum. By comparison everything else this week seems trivial- meetings about social enterprise and about possible (unlikely )links into West Sussex. I am preaching on Sunday…no shortage of material. "You don't increase the weight of a pig by weighing it!" We had a team discussion this week looking at how to better present our Interim Business Plan and project work in terms of the famous trilogy of “Inputs - Outputs and Outcomes”. I am notoriously skeptical about this methodology, notwithstanding its support and advocacy from highly regarded think tanks like New Philanthropy Capital and the Charities Evaluation Service. It works backwards from a high level aim – “Employability” or in our case “Improving the lives of young people by supporting our member organisations” through to specific activities that directly or indirectly contribute to that overall aim. I take it as a universal truth that no one organisation can make a significant social impact by itself, but has to work with others, and indeed the methodology “claims” the inputs of others. My criticism is that the methodology presumes straight line relationships between the three elements with little regard for other contributing factors or, unintended consequences. The net result is the risk of an over-stated, contorted and academically indefensible list of causes and effects being established in the name of performance management that takes time and effort (weighing the pig) and diminishing the time to deliver the work and improving the service (the weight of the pig). OF COURSE we have to demonstrate impact and difference, and in our very good team session we have followed the methodology but in a way that works for us, and fits with some new thinking about how we will account for staff time (inputs) and the share of overheads. Our thanks to our financial friends in Surrey Care Trust for their help on this - the issue was how to attribute overhead costs to externally funded projects. SO in sum we are improving our processes again in a way which we all think is practicable, as well as politic. Lots of follow – up and positive feedback from last week’s Reception at County Hall. It’s been a week of goodbyes ..to Toby Wells of Surrey CC’s Youth Justice Service – Toby pretty much invented the concept of restorative justice and argued bravely against locking young people in prison at a time when the Police and Judiciary saw no alternative. Also said goodbye to Hanna Moore my equivalent in West Sussex who is moving her family to her native USA. On a personal level our Foodbank start-up project is progressing well, and I am walking every week-end now..getting lighter and fitter..slowly. Enjoy the long week-end. The Chairman of SYF has announced the appointment of Cate Newnes – Smith as my successor as CEO. Cate has a strong business and management background originally with Reuters, then in consultancy and with The Young Foundation. She became CEO of the London Innovation Centre and is a long serving trustee of Groundworks, the charity that runs environmental projects in communities. Her full biography is on our website. Cate and I are meeting behind the scenes to ensure a smooth transition from the end of August when I retire. Cate starts on 1 Sept. and will be brilliant for SYF. We had a great event at County Hall last night - a reception for SYF existing and prospective members very generously hosted by the Chairman of the County Council, David Munro, who is one of our Patrons. It was an opportunity for networking by the 80 + people there, and to hear from the staff team about what we can offer our member organisations. Garath Symonds, Assistant Director for Young People talked about the re-commissioning of £32 mill. services that he is undertaking. Finally, we were able to pay tribute to David Hypher our recently retired Chairman who was warmly thanked by David Munro and given a framed scroll to mark the occasion. · statistics about the needs of young people in Surrey and a reflection on the importance of emotional intelligence and relationship skills as a prerequisite to learning and, later, employment. The point of the Strategic Review is to give member organisations information about the changing “big picture”- its challenges and opportunities. I am delighted that our work with Business in the Community (BitC) is resulting in a major international engineering company refurbishing one of our member organisations’ youth centre buildings today with about 25 of its highly skilled staff descending on the centre to blitz its electrical, plumbing and decorative work…. For free! A great example of collaboration. Interested to see that the third tranche of the famous Peterborough prison social impact bond (sib) is not being put out to the market for funding, but being commissioned directly by Government on a direct payment by results basis. This is being reported as the death knell of sibs. And finally, back to last night’s reception, my thanks to my great team who work so hard, and deliver so much. I have been absorbed this week in completing the next “Young Surrey: Strategic Review 2014-15” which will be published on Thursday 15th May at County Hall. We have nearly 100 guests coming to a networking event there for our existing Member organisations and for some 16 prospective new member organisations. The event is kindly hosted by the Chairman of the County Council – one of our Patrons - and is by invitation only, and we will be launching the Review at that event. I could go on..but it is an amazing world that young people are now growing up into. The Strategic Review makes much of the changes in values and experience between generations – from Baby Boomers (like me) to Generations X,Y and now Zero for today’s teenagers. It also contains some strategic points about the implications of Government policy, and data on young people in Surrey - not the least of which is 23,000 children in Surrey living in poverty, and the 12,000 in receipt of free school meals. The other exciting event next week is the announcement on Monday about Surrey Youth Focus’s new CEO who takes over from me at the end of August. I met with her for the first time on Thursday – she will be brilliant for Surrey Youth Focus and I am absolutely delighted. The weekend is my first 12 mile trial walk with a fully loaded rucksack in preparation for the Camino in September, and getting fizz /pouring drinks/hosting for a fund raising event on Saturday evening – I should sleep well! I have not said much about CommUniLAB of late, but the project is quietly progressing. A website is being constructed, and we had a great session with one of our Trustees (ex European Marketing Director for a major corporate) about the strapline that we might use. Great emphasis on the emotional content of words: positive, neutral or negative. So we have arrived at a strapline – more later. We met on Tuesday morning with a our principal funders and sponsors of CommUniLAB, Barclays, and had an really positive meeting. The basic website should be launched in late June, and the project launched in September. Tuesday was a long day (8.00am to 9.00pm) as we had a Trustees meeting in the evening when an Interim Business Plan was agreed – interim pending the appointment of my successor (announcement next week) and the Board received a presentation from the project manager about CommUniLAB. I gave a summary of the “Young Surrey : Strategic Review 2014-15” which I am rushing to get ready for an evening reception at County Hall on 15 May for our existing and prospective members. We have some 90 people coming – the event is being hosted very generously by the Chairman of the County Council who is one of our Patrons. The Strategic Review covers national context, Government policy, organisational changes and, interestingly, the impact of changes in the values and behaviours of young people between generations. It concludes with an update on the key issues affecting Surrey's young people. The point of it is to provide a strategic context for grant bids and strategic positioning for member organisations. 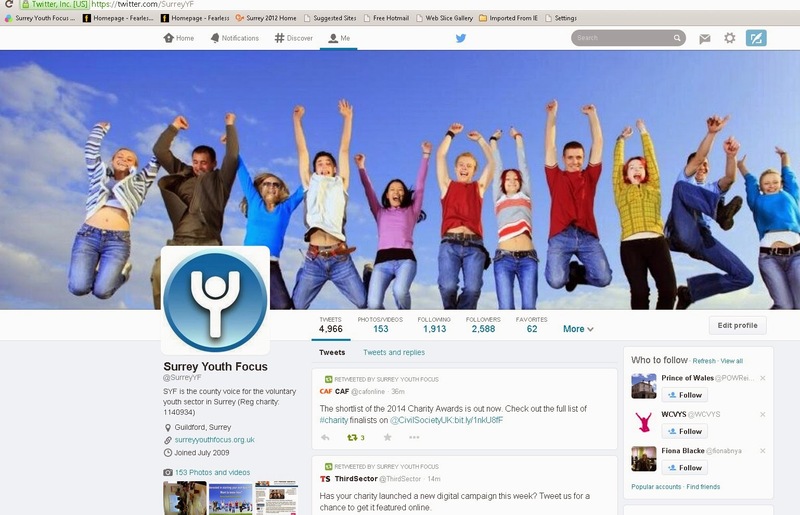 Our reputation grows in relation to social media - we have 2,464 followers on Twitter - @SurreyYF and we were chosen by @CharityHourUK as their focused charity for an hour in a storm of tweeting (#charity hour) on Wednesday evening. I mustn’t forget my wife’s birthday on Sunday - all under control really. Food Bank project going well at home. Another long week-end!